Big Brother Gossip: Saturday Morning - Would all the J's step forward please? Saturday Morning - Would all the J's step forward please? As we saw Shelli and Liz, yes it was Liz not Julia, won the first part of this weeks HoH competition and so had to make nominations on Friday. I'll save you the back and forth and discussions went on in the spirit of brevity and cut to the chase - the group that is sort of (or thinks they are) in power this week would be Shelli, Clay, Liz (Julia), Austin and Vanessa. The nominations ended up being Liz: Jackie & James --- Shelli: Jason & John. I am sure it is a complete coincidence that they nominated the J's - in alphabetical order even.... Becky, Steve and Meg could have all been listed and I would not have been surprised. The target is actually not very firm yet, Vanessa (not a HoH as we know but seems to think she still is in some ways) is concerned about the two unknown votes for Jeff. To review, Jackie and John voted as they had said they would for Jeff to stay. Steve and Liz surprised everyone (including all viewers and likely even Julia) by also voting to save Jeff. Most of the house has concluded that someone is America's Player and was forced to vote for Jeff, thus accounting for one vote (which is wrong of course), the second vote is what is really bugging them. Vanessa thinks it was either Becky or Steve and eventually, wrongly, settled on Becky. The 'plan' as I understood things was to have Jason and John win the BoB competition. Shelli specifically told them both she wanted them to win it so she would be able to compete for HoH next week feeling she was safe with Liz/Julia as HoH this week. But that's not how it worked out and somehow Jackie and James pulled off the win so they are safe this week and Liz is back among the common people sleeping downstairs. We now await the POV competition today/tonight. It often takes place during our weekly Big Brother Gossip Show so be sure to tune into it at 10pm Eastern tonight! We'll be discussing all of the above in much more details with charts, audio clips and snark galore! As of the early morning (I'm still catching up), I see that Audrey is FAR from safe as a 'backdoor' target and Shelli has even suggested the possibility of going after Austin this week. If you don't have the live feeds - please consider signing up through this site. 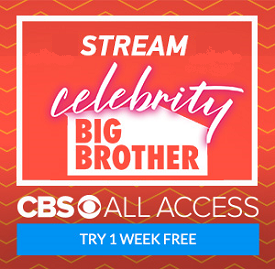 You get one week free access to the live feeds as well as tons and tons of CBS programming and even live CBS programing in certain markets (more added all the time). Click Here for your 1 week trial and thanks!